Animal-vehicle collisions are not only costly, but can be dangerous. From 2001-2011, animal collisions contributed to more than 2,080 fatal crashes nationwide. 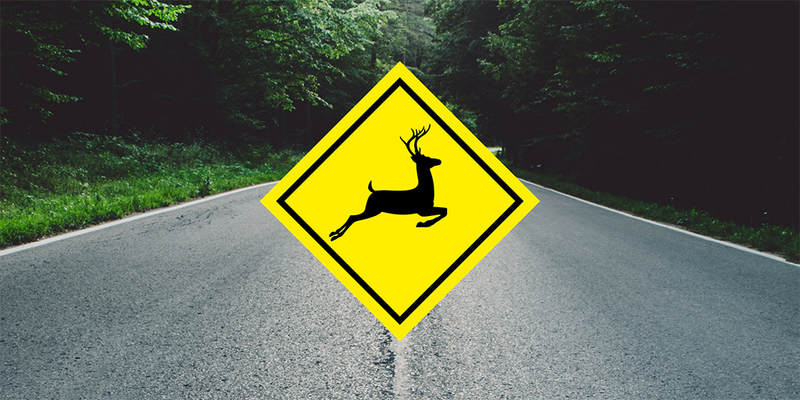 Whether a deer, dog, moose or squirrel, animals on the roadway are unexpected, and their actions can be erratic and unpredictable, creating a dangerous situation for motorists. Most wildlife-vehicle collisions occur during the fall and winter, and many are preventable. Scan the road and shoulders ahead of you. Looking ahead helps provide enough reaction time if an animal is spotted. Also, remember some animals move in groups, so when there is one, there are usually more in the area. Use high-beam headlights if there’s no oncoming traffic. Wildlife may be spotted sooner when using high beams. This will give the driver time to slow down, move over or honk the horn to scare the animal away. High beams also help in spotting some animals’ reflective eyes. If a collision is unavoidable, apply the brakes firmly and remain in your lane. Swerving to avoid an animal can often cause a more serious crash or result in drivers losing control of their vehicles. Be extra cautious at dawn and dusk. Most animals, especially deer, tend to be more active early in the morning and at dusk. Slow down and use extra caution when traveling through areas with a high and active wildlife population.